The green terror (Andinoacara rivulatus), also sometimes incorrectly classified as the gold saum, is a hardy and popular freshwater cichlid. These fish live up to their name and tend to be very aggressive, the females more so than the males – though some individuals can be relatively peaceful. Green terrors are often confused with the closely related Andinoacara stalsbergi (also known as the Green terror). The best way to tell the fish apart is by looking at the fin edging and coloring. Andinoacara rivulatus has light blue scales with a green edge, while A. stalsbergi has dark blue scales with a green center. Also, the A. rivulatus tends to have a thicker white or orange edging on their fins, while the edging on the A. stalsbergi is slightly thinner. Green terrors are also sometimes confused with the Blue Acara (Aequidens pulcher), and they were originally classified under this name when they were first introduced to the aquarium trade. These fish are native to the west coast of South America along the Pacific Ocean and are found in central Peru and western Ecuador. They inhabit still waters in streams and rivers but notably aren’t found in several of the waterways with a high pH. 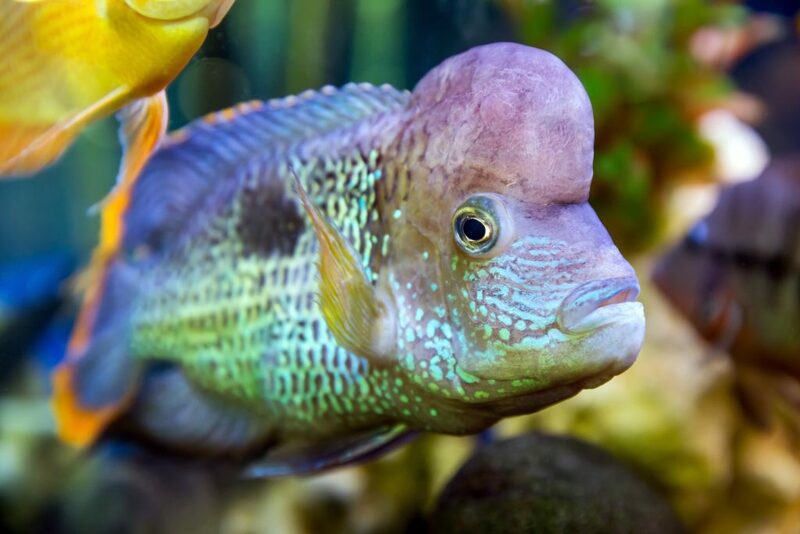 In the home aquarium, green terrors usually live between 7-10 years, but there are reports of these fish living longer. A full-grown green terror may reach a length of up to 8 inches (20 cm), with the males growing larger than the females. Green terrors tend to be hardier than the average cichlid, and they make an excellent starter cichlid as they are more forgiving of mistakes that would be fatal to other, more delicate species of cichlids. However, this shouldn’t be seen as an invitation to ignore regular aquarium maintenance, as these fish still need a well-maintained aquarium. It’s recommended that these fish be kept in a species only aquarium and a single specimen can be kept in a fish tank as small as 40 gallons. However, if they are kept in a community tank, then a minimum of 75 gallons should be provided, and their tankmates should be large, similarly aggressive fish. Small fish should be avoided, as anything small enough to fit into a green terrors mouth will be eaten. Docile fish should similarly be avoided, as they will be harassed constantly and possibly even killed by mature green terrors. Any aquarium containing green terrors should provide numerous hiding places, along with an open area for swimming. Driftwood should also be added and has the added benefit of softening the water in locations with moderately hard water. While aquatic plants can be added, care should be taken to choose the proper species that won’t be destroyed by green terrors. Any plants placed in the substrate will likely be dug up, and even plants that grow attached to rocks or ornaments may be destroyed. Floating plants are often successful with green terrors and some recommended plants are – Duckweed, Water Lettuce, and Amazon Frogbit. Plants that don’t root in the substrate may also be successful, such as Anubias, Java fern, Java moss, and Hornwort. A powerful filter should be provided for any aquarium containing a green terror, and these fish are an excellent candidate for a canister filter. I personally use the Fluval Canister Filters on my larger tanks, and the Fluval 306 Canister Filter is an excellent choice for a green terror aquarium. Not only does it keep the aquarium water in pristine condition, but it’s also a workhorse and is much easier to maintain than other types of filters. Most sources state green terrors are omnivores in the wild, but there seems to be little research available to back this claim up. They seem to thrive with a meaty diet in the aquarium and should be viewed more as carnivores. Their diet should be comprised of a high-quality cichlid food, along with regular offerings of live and frozen foods. I personally recommend Omega One Super Color Cichlid Pellets, which provides the nutrition the fish need and will enhance the green terror’s colors. They should also regularly be provided live or frozen foods, including earthworms (cleaned and sourced from areas without pesticide use), bloodworms, blackworms, daphnia, and shrimp. Lightly blanched vegetables should also be provided occasionally. 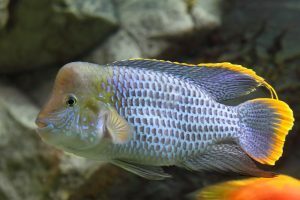 Like many other cichlids, breeding is relatively easy with green terrors and should occur if a bonded pair is placed in an aquarium. To encourage breeding, the temperature should be raised to between 77-79°F (25-26°C) and frequent, small water changes should be done. Sexing these fish as juveniles is difficult but become easier as they mature. The males are generally larger than the females and with age, will usually develop a bump on their head. Also, the orange border on the male’s tail is often larger and less distinct than the females. Meanwhile, the females are usually darker and will have less contrast between colors. For spawning to occur, it’s important to provide a flat space, such as a large rock, ornament, or open piece of non-toxic pottery (beware of imported painted pottery). In preparation for mating, the female will clean off the surface, and then deposit up to 400 eggs. The eggs will normally hatch after three to four days. The fry will feed on their egg yolk sack for several days, but after that, they should be fed infusoria. Afterward, they should be moved onto either baby brine shrimp or microworms (Learn how to Culture Microworms). Commercial fry fish foods are also acceptable. Once the fry are a few weeks old, they can be moved onto finely ground fish flakes. It’s not uncommon for green terrors to experience problems during their first few spawning attempts. Often, the eggs or even the newly hatched fry will be consumed. But after several attempts, they will become excellent parents who care and protect their fry. Green terrors will do well with most of the mid-sized and semi-aggressive cichlids commonly available in the hobby. Some excellent tankmates are Jack Dempseys, Firemouth Cichlids, Flowerhorns, Convict Cichlids, and possibly Oscars. But it should be noted as these fish mature and breeding occurs, serious aggression issues will occur unless very large aquariums are provided.